The midseason premiere picked up exactly where we left off; Jesus is dead. The gang are still in the creepy cemetery and they have to fight their way out while trying to carry Jesus’ body with them. 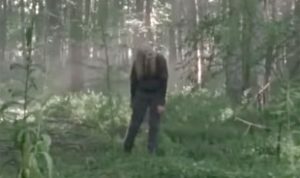 Now that we know that these Whisperers are disguised as walkers it is not so easy to do battle since, at any moment, one of these walkers may duck or be armed! It truly adds a new dimension of fear into the show. On the road back to Hilltop, Michonne and daryl have a heart to heart. Several tidbits are revealed. Machine vouches for the new people. She says it will mean a lot to Hilltop being able to bury Jesus. “Sorry I couldn’t do that for you” Daryl tells her. “Thank you for trying to find him and thank you for after” Michonne says. The ‘after’ I am assuming refers to the X scars they both have on their backs. We should see flashbacks in the coming episodes that will finally explain this. They run across a band of walkers approaching on a bridge. Daryl smartly shoots one in the leg, no reaction. Then he shoots another one in the leg and it’s a whisperer. he screams out in pain and immediately is descended upon and eaten. 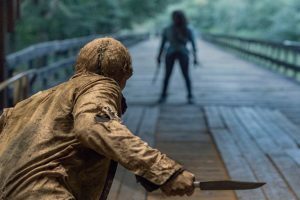 Another whisperer pulls a knife from his sleeve and attacks Michonne. Silly Whisperer. A third drops its knife and gives up. Its a woman who pleads for her life and says that they killed all the others and she’s the last one. LIES!! 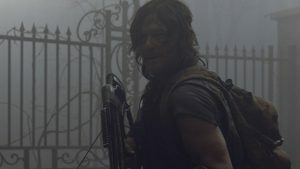 Daryl decides to take her with them as a prisoner. Machonne is not so hot on that idea. What a sad scene! I teared up as everyone saw Jesus’ body slung over the horse. Everyone will be looking to Tara now to make the decisions and be their leader. Sadie sets Eugene’s leg and this is the moment Eugene decides to tell Rosita he loves her which sends Rosita fleeing the hospital to go throw up. But it’s not because of Eugene. She’s got a bun in the oven. And the father is Sadiq!!! Father Gabriel is not going to like this! Neither does Eugene who overheard their conversation through the window. TV Eugene never had a chance. Comic Book Eugene was luckier. They ended up together. Machine and Tara interrogate the prisoner while Daryl looks on. Henry is still down there in a cell as we’ll which also upsets Daryl. The prisoner plays dumb and cries a lot. She claims they killed the rest of her group but nobody believes that. 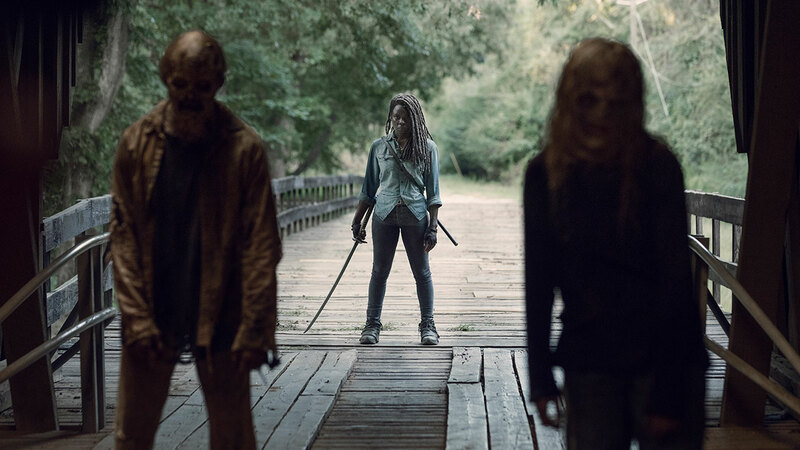 Michonne plans to take her people and head back to Alexandria. Daryl assures her he will get the prisoner to talk. “If she doesn’t you know what to do.” She tells him. Daryl interrogates the prisoner again by himself. He;s tough on her, throwing her around the cell. Henry implores him to stop. He gets her to tell him her name is Lydia. She admits that her mom and her were part of groups with walls before but that places with walls can’t keep you safe and always fail. So they found a way to coexist with the walkers. Daryl chastises Henry for defending Lydia. Lydia then starts talking to Henry and Henry eats it up with a spoon, Of course, this was Daryl’s plan all along. He sits outside by the window and listens to their conversation, hoping to glean more info. Now that he’s free the first order of business was to pluck a tomato off the branch and eat it. He then went into the big house and into Michonne and Judith’s room. He took a compass. 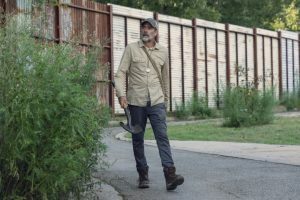 It’s broad daylight before he tries to jump the fence and gets caught by Judith. He manages to talk his way out of being shot and she allows him to go. “But if I see you again I’ll shoot” Judith tells him. 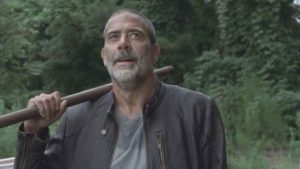 Out on the road, Negan runs into wakers for the first time in 7 1/2 years! He kills a few with a shovel but it’s obvious he needs to get in killing shape. he later drinks some bad water and has to throw up on an open field. ironically, it’s the same open field where he bashed Abraham and Glenn’s heads to mush. Creepy. He finds a clothing store that has a ‘Leather Goods” section. He finds a new leather jacket, but no red scarf. Then security shows up: three growling canines! He runs for his life! He manages to bust through a door where a waiting walker is there. He throws him into the store and closes the door. We hear the whimpering of the poor dog. Jeffrey Dean Morgan assured us on Taking Dead after that no dogs were eaten by zombie during the making of the episode. He finally reaches home. The sanctuary. He finds a pipe which he swings on his shoulder like a makeshift Lucille and does his tardemark whistle The place is a mess. He does recognize one of the walkers roaming around. “Big Ritchie!!! Loyal to the end.” He tries to clean up a little and makes a little living room in the middle of the empty warehouse. Eventually, Negan goes out in the yard and starts killing all the remaining Savior walkers except Big Ritchie. He can’t do it at first but then knows he has to. As Thomas Wolfe said, ‘You Can’t Go Home Again”. 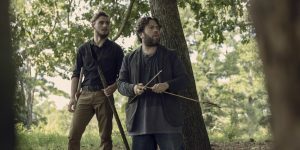 Luke and Alden go looking for Michonne, Jesus and the rest and not knowing that they’d already returned to Hilltop go on an unnecessary excursion further and further out. They find a trail of arrows that Luke recognizes as belonging to Yumiko. They come across a lone walker and just as Luke is about to approach it, the walker stops and stands still. Uh oh. they soon realize they are surrounded by silent and still walkers only these ain’t walkers. The leader pulls out a sawed off shotgun and points it at them. The leader of the Whisperers is Lydia’s mom. 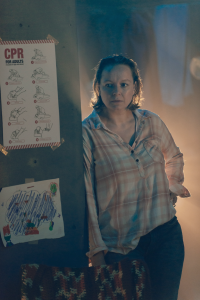 her name is Alpha and she is being played the terrific actress Samantha Morton! The opening scene of dead Jesus and the blood oozing out of him. Thanks. 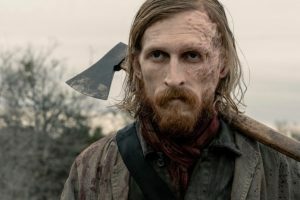 Dwight (Austin Amelio) is joining the cast of Fear The Walking Dead!! 1 The Whisperers are going to be a formidable enemy and perhaps the scariest and deadliest yet. 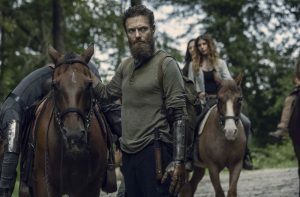 2 Negan will no longer be a prisoner and will become a leader in the fight with The Whisperers. 3 If you’re shipping Henry and Lydia you’re not alone. ‘Henia?’. He’s going to get everyone in trouble but he’ll betray her before the end of the season. 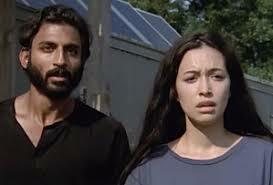 4 So Rosita is pregnant with Sadiq’s baby but involved with Father Gabriel and being wooed by Eugene. The most sought after woman in the zombie apocalypse! One of these guys are going to die before the end of the season. This kind of tension can’t hold!! 5 Danai Gurira is leaving TWD!!!! How many main characters can you lose! You can’t keep whisking them away on a helicopter! She’ll be back for a few episodes in Season 10. I don’t think they can kill her. I think they just don’t show her but acknowledge she’s still at Alexandria.